Providing you the best range of twill weave coverall, fire retardant modacrylic coverall and cotton coverall with effective & timely delivery. we have inhouse dyeing facilities to save time and consistant quality/ Our brand "Fashion Plus" is renowned for coveralls, Work wears & protective wears have distinctive features like high tearing strength, durability, colour fastness, comfortable wear and perfect fitting. 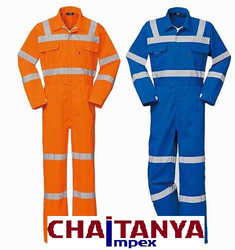 We can manufacture coveralls, Work wears and protective wears with reflective Hi-Viz tapes and logo printed/embroidered as per functional requirement of our client. Inherent flame retardant fabrics which is used in high risk hazard industries such as petrolium/gas exploration, petrochemical, power, welding, molten iron and steel furnice industries where fire and flame are involved. Monacrylic fibre is imported and a must wear in western countries. Fabric is Fire / Flame retardant irrespective of number of washes which gives protection forever. 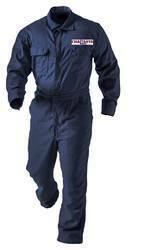 We are the leading manufacturer of fabric and coveralls, work wears, protective wears & safety coveralls. 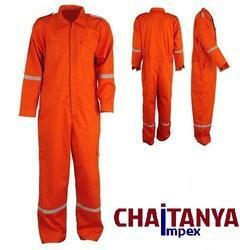 We manufacture cotton coveralls in different weaves like twill, drill, satins, ribstops in 100% cotton. We also make coveralls & protective wears with reflective tapes & logo embroidered /printed as per functionality or requirement. Looking for Coverall, workwears, protective wear ?